Keep your feet warm and your family comfortable with heating tile floors. We install heated tile products that improve the timeless beauty and hygienic cleanliness of tile with the introduction of radiant heating. Imagine how nice it would be to have warm tile floors when stepping out of the shower or bathtub. No more cold floors that sends shivers up your spine. With radiant floor heating, you and your family enjoy the gentle warmth of heated flooring even when the temperature drops below freezing. It makes drying off and dressing so much more pleasant. Best of all, heated tile floor installation is affordable. We cater our products and services to match your budget as much as possible. Adding heated tile flooring to your home is the ultimate in creature comforts. It is also a wonderful convenience that everyone will enjoy and benefit from. Why suffer with the chill of winter that sinks into your bones? Let us help your family enjoy warmth no matter how chilly it is outside. Our heated tile floor installation technicians can install our special trademarked electric heating system in your home. We use the Schulter™ DITRA-HEAT system that has been specifically developed for tile floors. With this system, electricity provides the heating for tile floors, while waterproof uncoupling membranes absorb stress and prevent the tile and grout from cracking. 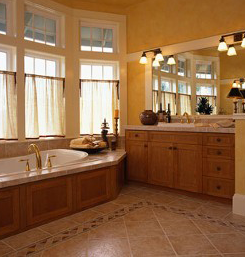 One of the most popular places to use heated tile floors is in your bathroom. You and your entire family will love it and enjoy its warm benefits. In fact, our customers tell us that they find it especially welcome for children who get chilly very quickly after a bath or shower. Installing heated bathroom tile in your bathroom provides a spa-like setting that everyone can enjoy. In addition, the heated tile isn’t just for the bathroom. 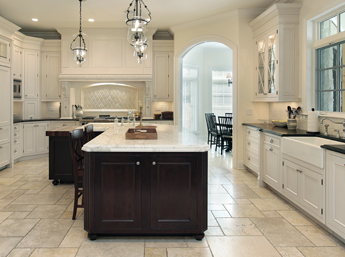 The kitchen is another room that benefits greatly from heated flooring. When we install it, you and your family can go barefoot in the winter without getting cold feet. Consider heated tile for your living room, foyer, and bedroom too. Let us make your home a more welcoming and comfortable place with heated tile floors. The professionals at our tile store have the knowledge and experience to install an electric heating system that takes the chill out of winter. Do You Need Underfloor Heat for Tile? Tile is beautiful, but it’s not something you want to walk on when it’s cold outside. Let us provide underfloor heat for tile in your home. Whether you are building a new house or you want to install radiant heating in your current home, we can accommodate your needs. Simply visit out location, browse our selection, and we’ll set up a time to install your new tile. We know you’ll be happy with the results. In fact, it will warm your heart and feet! It doesn’t snow very often in our area, but when it does, you can certainly feel the chill in the air and on your floors. Let us bring the heat to you by installing radiant floor heating in your home. The electric floor system we use by Schulter uses an innovative heating system that also allows for customized heating zones. It is ideal for any room in the house. In addition, it has a programmable thermostat with more than 250 functions. Whether you have stone or ceramic tile, you’ll find that our radiant floor heating systems offer reliable performance. Most importantly, a heated floor leaves an excellent impression – especially if you are trying to sell or rent your home. Customers are drawn to tile floors that are heated, because they introduce an added level of comfort and luxury. In turn, a heated floor adds more value to your home, allowing you to increase your asking price. Contact us today to make winter warmer with toasty heated tile floors. We specialize in heating tile installation for homes and businesses in Marietta, Roswell, Atlanta, Alpharetta, and Kennesaw, GA.